Looking For More Than Just a “Truck?” – Think GMC Trucks! If you’ve been hunting around for a new pickup, we’re sure you’ve found yourself searching for GMC trucks for sale. Each of the brand’s nameplates prove to be unique in their own specific way, providing buyers with some tough decisions. This particular nameplate may be one of the brand’s smaller pickup offerings, but that doesn’t mean the vehicle should be ignored. 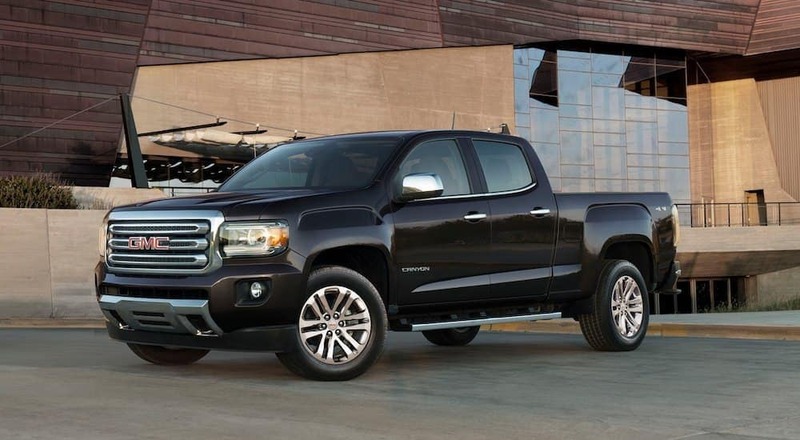 While the 2019 GMC Canyon may not be capable of delivering as much power as some of the brand’s other pickups, the vehicle makes up for it with an enjoyable driving experience. A big reason for this sentiment revolves around the interior amenities, each of which play a role in maximizing entertainment and convenience. The brand’s infotainment system makes it easy to access an assortment of applications, including radio and navigation. Plus, thanks to the Apple CarPlay and Android Auto compatibility, drivers will never have any issues connecting their smartphone to the unit. The brand even offers the 4G LTE Wi-Fi, meaning your new pickup truck can be the perfect hub for any worksite. Otherwise, the other amenities tend to impact convenience. For instance, the available wireless changing dock assures that you’ll never have to mess around with any pesky wires, meaning you can charge your phone without the mess. Meanwhile, the rearview camera makes it easy to constantly monitor everything that’s happening behind your pickup, thus preventing any collisions. Thanks to this inclusion, you can be assured that your new 2019 GMC Canyon will always remain in tip-top condition. Pickup trucks are generally known for their truck bed, and the 2019 GMC Sierra 1500 won’t disappoint if this is a major priority for you. The nameplate delivers a number of amenities that will make loading transporting your cargo a whole lot easier, thus making the nameplate one of the premier choices for those seeking a hauler. The nameplate includes the world’s first Six-Function MultiPro Tailgate, assuring you’ll always have the flexibility to get the most out of your new pickup. The system includes a number of amenities that will help to make securing and loading that cargo an absolute breeze. One of these six functions is also a built-in step, meaning it will be more than easy to access the rear of your new pickup. Of course, the Sierra 1500 does a whole lot more than deliver an impressive truck bed. Rather, the vehicle has been built to haul, as the pickup delivers up to a 12,200-pound towing capacity. To help drivers make the most of that driving prowess, engineers included a number of amenities that will make hauling your cargo a whole lot easier. The ProGrade Trailering System ensures that your truck and your hauled goods are always in complete control, while the High Definition Surround Vision Camera assures that you’ll constantly have the ability to view your surroundings. The 2019 GMC Sierra 1500 has a reputation of being one of the top worksite companions, and we’d say that honor is well earned. The 2019 GMC Sierra HD is all about power, and seemingly all of the inclusions and attributes of the ride play a significant role in this sentiment. It naturally starts with the incredible engine offerings, each of which manages to deliver a whole lot of power. The 6.0-liter V8 engine proves to be one of the most impressive offerings in the entire segment, promising drivers up to 360 horsepower and 380 pound-feet of torque. This has a predictable impact on other specs, as drivers can expect a towing capacity that’s north of 15,000 pounds! If you’re really looking to get the utmost power out of your new pickup, then you should switch your focus to the Duramax 6.6-liter turbo-diesel V8 engine, which cranks out an incredible 445 horsepower and 910 pound-feet of torque. Of course, the other mechanical inclusions help to influence the vehicle’s overall drivability. The Allison Automatic Transmission is intuitive and reliable, allowing drivers to easily switch between their preferred gear. The All-Terrain capability means the pickup is more-than-prepared for any adventures, while the sound-deadening materials assure that you’ll have a quiet, enjoyable journey. Who doesn’t like limited? Engineers seemingly focused in on this unique pickup truck, and it resulted in one of the most versatile offerings in the entire segment. The nameplate truly delivers everything you could possibly want from a new pickup truck… and a whole lot more. The vehicle predictably promises a whole lot of power via the incredible 5.3-liter V8 engine, which ultimately cranks out an incredible 355 horsepower and 383 pound-feet of torque. Engineers added a number of additional amenities that will help you get the most out of your SUV’s capabilities, including Advance Trailering Technologies and the essential Hill Descent Control. The 2019 Sierra 1500 Limited’s cabin isn’t your typical interior. Rather, the vehicle has been filled with a number of technological amenities that will help to boost any driving experience. The GMC Infotainment System makes it easy to access an assortment of useful applications, while the accompanying Apple CarPlay and Android Auto compatibility mean you’ll always be able to stay connected. There’s even an available 4G LTE Wi-Fi hotspot, providing options for those who may be looking to transform their pickup into the ultimate worksite truck. To top it all off, the pickup is more-than-safe, as the vehicle is fully prepared to help keep passengers safe. The StabiliTrak system is intended to keep drivers on their intended path at all times, while the Hill Start Assist system will give them that extra boost when traveling on an incline. The sturdy body structure and the accompanying airbags will protect passengers during an emergency or accidents. If help is needed, drivers can easily rely on the OnStar Safety and Security plan, which will summon emergency personnel to the site of the crash. Carl Black Roswell Buick GMC – Your Home For GMC Trucks For Sale! You’re clearly going to have a tough time choosing between any of these impressive pickup trucks. Fortunately, regardless of what nameplate you end up opting for, you can rest easy knowing that you’ll be happy with your decision. Once you’ve zeroed in on a particular model, it’s time to start buying. Well, if you live in the Roswell, Georgia area, there’s no better place to make your next purchase than Carl Black Roswell. Why? Well, the dealership provides everything you could possibly want and need during your buying ordeal. Their competitive prices and vast inventory means you’ll get a combination of the best ride and the best deal. Meanwhile, their various services (including a financing department) will come in handy before and after you’ve made your purchase. So what’s the hold-up? If you know which GMC truck you’re going to opt for, then head out to Carl Black Roswell today. The helpful sales team will get you started on your purchase, and you could be cruising off the lot in your new truck before you know it!